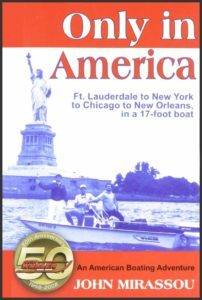 Only in America: An American Boating Adventure by John Mirassou is a rollicking, touching, at times outrageous Valentine to our country, in a story that combines elements of Huckleberry Finn, The African Queen, and Surfin’ USA. This exciting buddy story follows “The Three Johns,” twenty-something lifelong friends from Redondo Beach, California, in their 17-foot Boston Whaler, as they take the trip of a lifetime through the eastern waterways of America, a nautical variation on the classic road trip saga. The author’s style is so natural and engaging, yet polished and accomplished, that he makes writing seem easy: an effortless telling of an epic adventure by a natural-born story-teller. However, there is nothing easy about this trip as the guys tackle rivers and lakes, alligators and snakes, horrendous storms and endless summer days. From the Intracoastal Waterway to Old Man River, Chesapeake Bay, Erie Canal, Great Lakes and the Ten-Tom — 6,100 miles of American waterways and some of the most interesting and affable characters you ever will meet. This book is a profound and personal celebration of America, its rivers, shores, forests, but most of all, its people. Every time the guys meet with some amazing instance of kindness, trust, hospitality, and just plain warmth, the author states the motto of the trip: “Only in America,” a concept coined by his dad. It takes a nation to make a voyage like this possible, and the American people come through every time, with food, drink, lodging, and above all, unconditional friendship. This story had me smiling, chuckling, and laughing out loud. Jump into The Whaler with John, John and John for a trip you’ll never forget: Fun, fun, fun!